1.) Set oven to broil. 2.) In a large bowl, combine the Serrano ham and salt (and a dash of pepper,) to the pork mixture and thoroughly combine with your hands. Set aside. 3.) Heat canola oil in a cast-iron skillet to medium-high heat. 4.) Peel the plantain and slice 8 long, very thin slices with a vegetable peeler and place in the skillet. (Plantains will crisp and curl up very quickly, so keep watch) Remove crisp plantain chips, and set on a paper towel-lined plate. Salt liberally. 5.) Wipe out the bottom of the skillet with a paper towel, and place brioche rounds in skillet. Toast them so they are a little browned. (They will toast quickly, as the brioche have a high butter content)Set aside. 6.) Shape each pork patty into 2-2 1/2 inch round patties and place on baking sheet. 7.) Place patties under broiler for 5 minutes on one side. Remove and flip to broil other side for only 4 minutes. 8.) Cut the 4 Swiss cheese slices into quarters for topping the patties. 9.) Remove the patties from the oven and top with the Swiss cheese pieces,then return to the broiler for one more minute. 10.) Remove the patties from the oven and slather each toasted, broiche round with champagne mustard, then a little pickle relish. 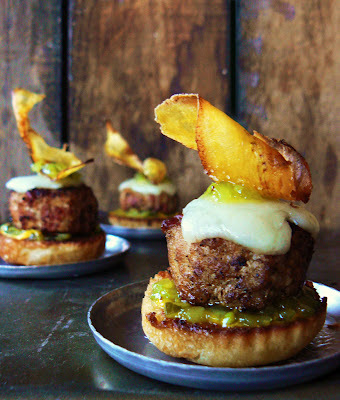 Add the pork patty, a little more pickle relish, and nestle the salty, plantain chip onto the cheesy-topped patty. Serve immediately.